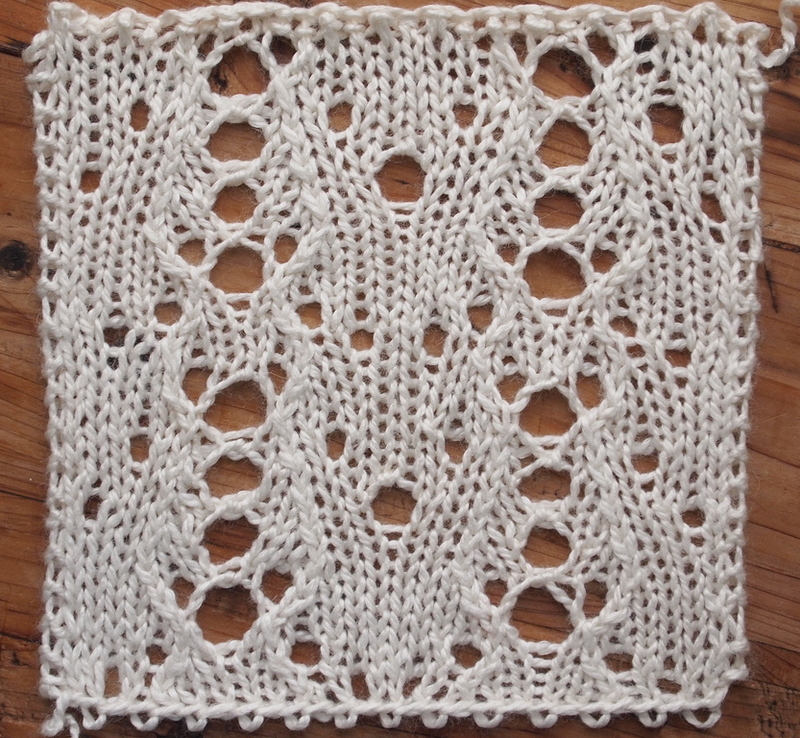 Turning a grid into a lace chart can be very satisfying, but is also a bit more complicated. I’m going to present an introduction here, but not go into details, as this could involve a full article by itself. 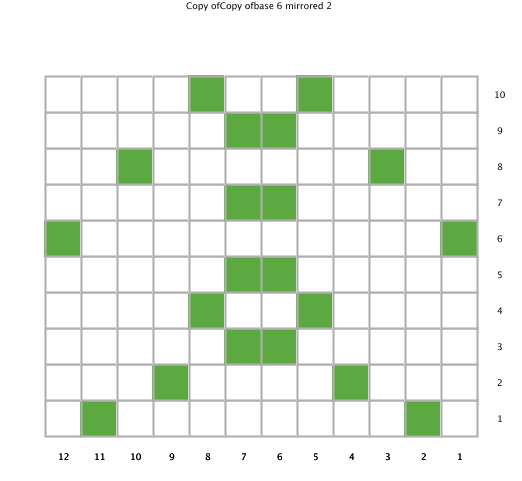 All these stitch patterns are multiples of 12. 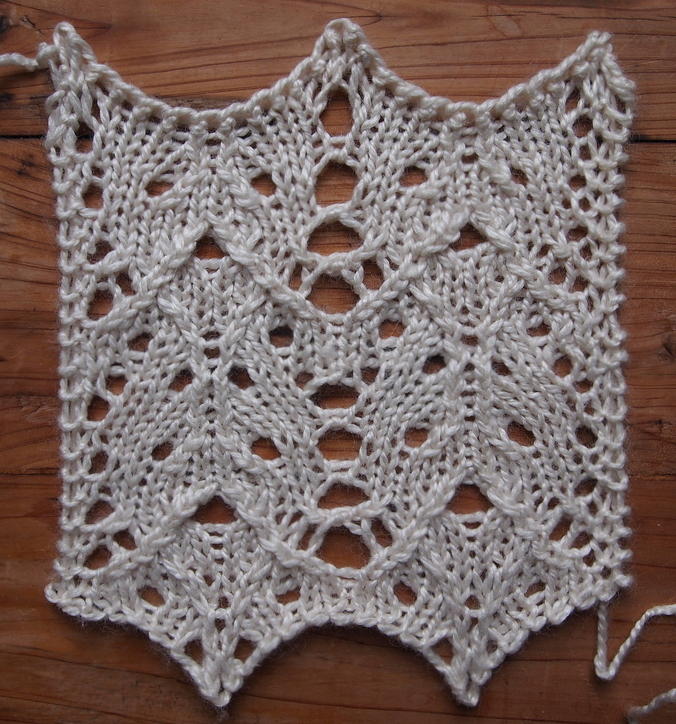 The return rows are all purl stitches, except that I knit one and purled one into each double yarn over. Row 2 and other wrong side rows: purl. For double yarn overs, knit the first loop and purl the second. Row 1 (RS): ssk, yo, k8, yo, k2tog. 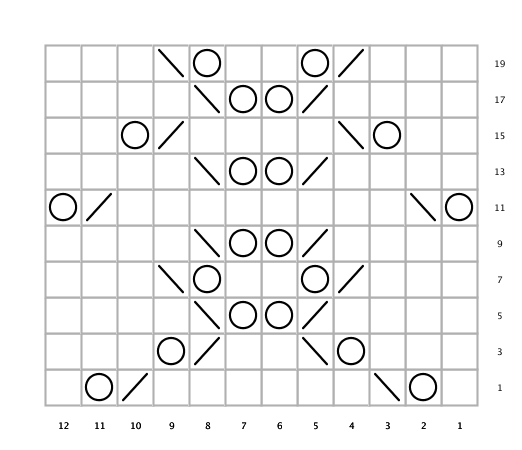 Row 3 (RS): ssk, k2, yo, k4, yo, k2, k2tog. Row 5 (RS): ssk, k4, yo2, k4, k2tog. 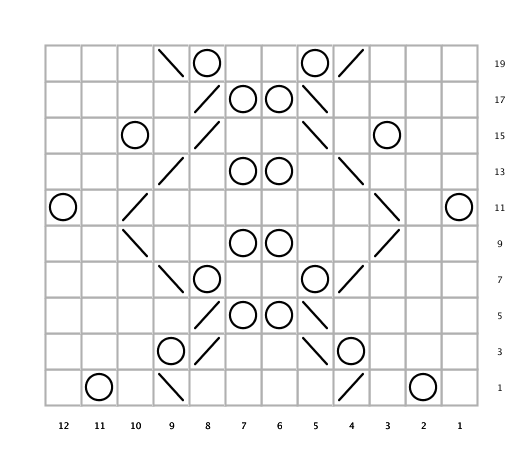 Row 7 (RS): ssk, k3, yo, k2, yo, k3, k2tog. Row 9 (RS): ssk, k4, yo2, k4, k2tog. Row 11 (RS): yo, ssk, k8, k2tog, yo. Row 13 (RS): k2tog, k4, yo2, k4, ssk. Row 15 (RS): ssk, k, yo, k6, yo, k, k2tog. Row 17 (RS): ssk, k4, yo2, k4, k2tog. Row 19 (RS): ssk, k3, yo, k2, yo, k3, k2tog. Row 2 and all other wrong side rows: purl. (When you come to a double yarn over, knit the first loop and purl the second. 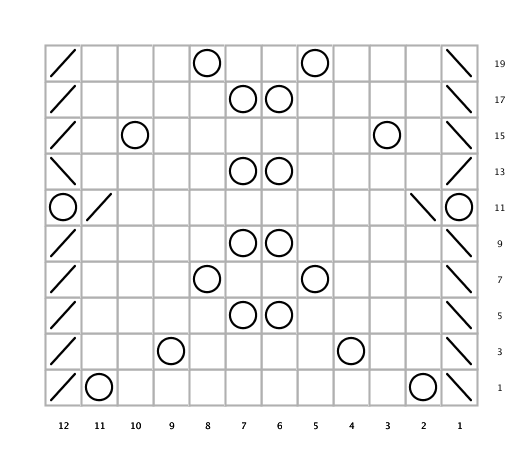 Row 5 (RS): 1/1 LC, k2, k2tog, [yo] x 2, ssk, k2, 1/1 RC. 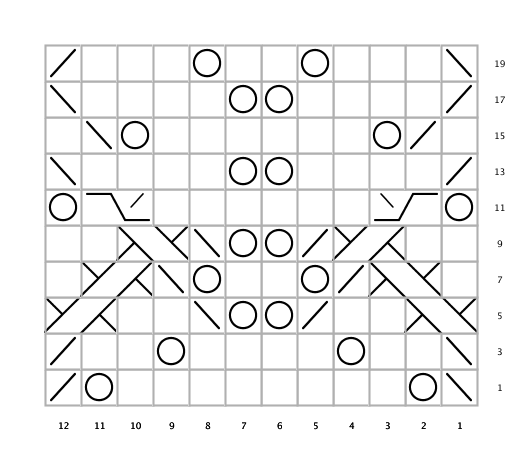 Row 7 (RS): k, 1/1 LC, k2tog, yo, k2, yo, ssk, 1/1 RC, k.
Row 9 (RS): k2, 1/1 RC, k2tog, [yo] x 2, ssk, 1/1 LC, k2. Row 11 (RS): yo, 1/ssk RC, k6, 1/k2tog LC, yo. Row 13 (RS): k2tog, k4, [yo] x 2, k4, ssk. 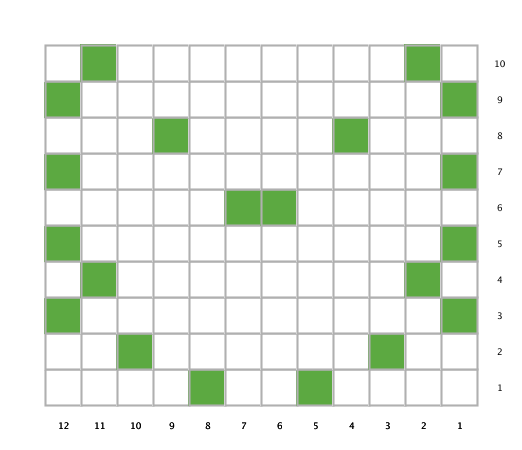 Row 15 (RS): k, k2tog, yo, k6, yo, ssk, k.
Row 17 (RS): k2tog, k4, [yo] x 2, k4, ssk. 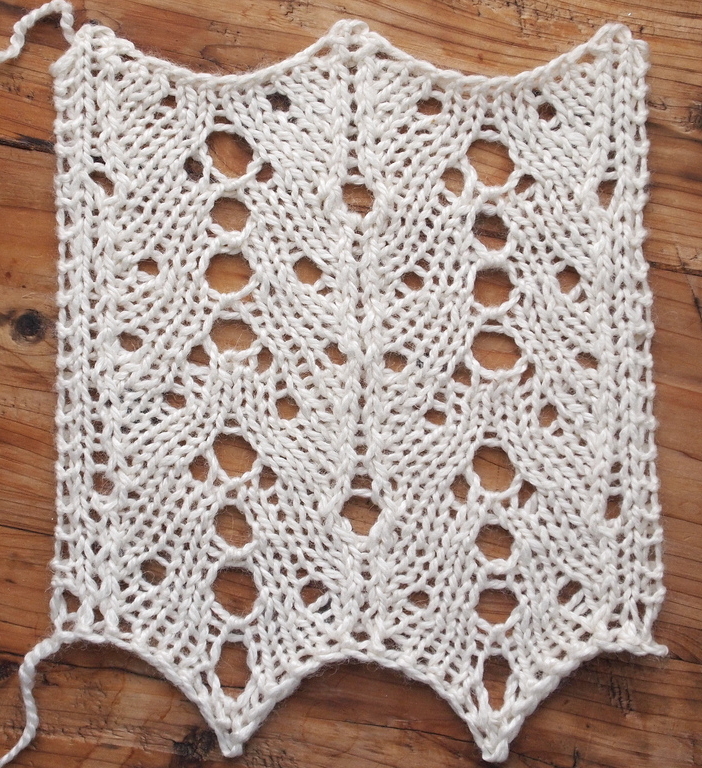 Wow, what a fun approach to lace knitting. Thank you for sharing your experiments.